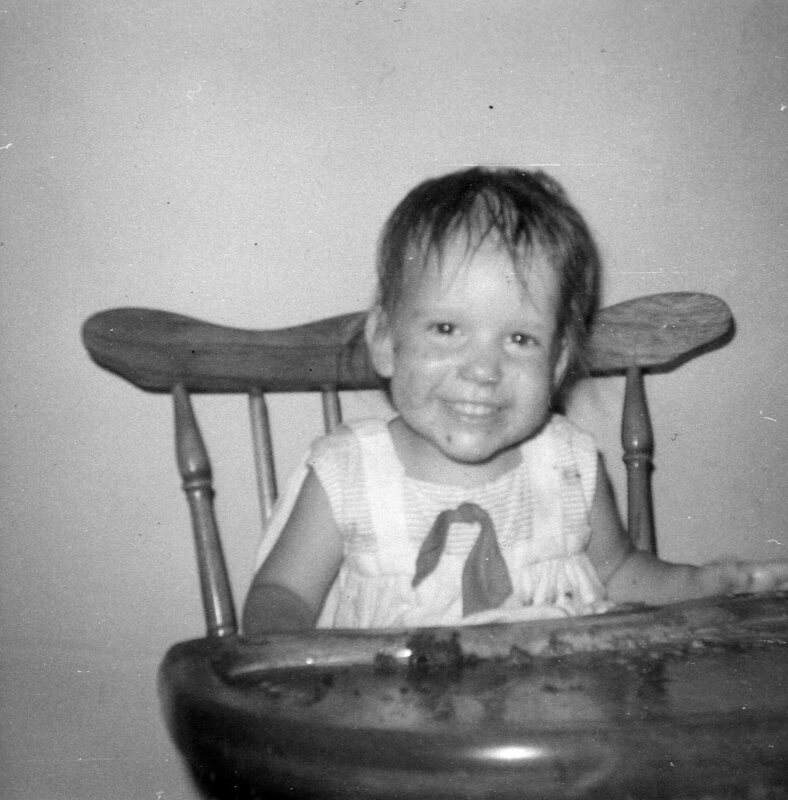 This is a picture of me, circa 1968, after a massive throwdown with chocolate cake. 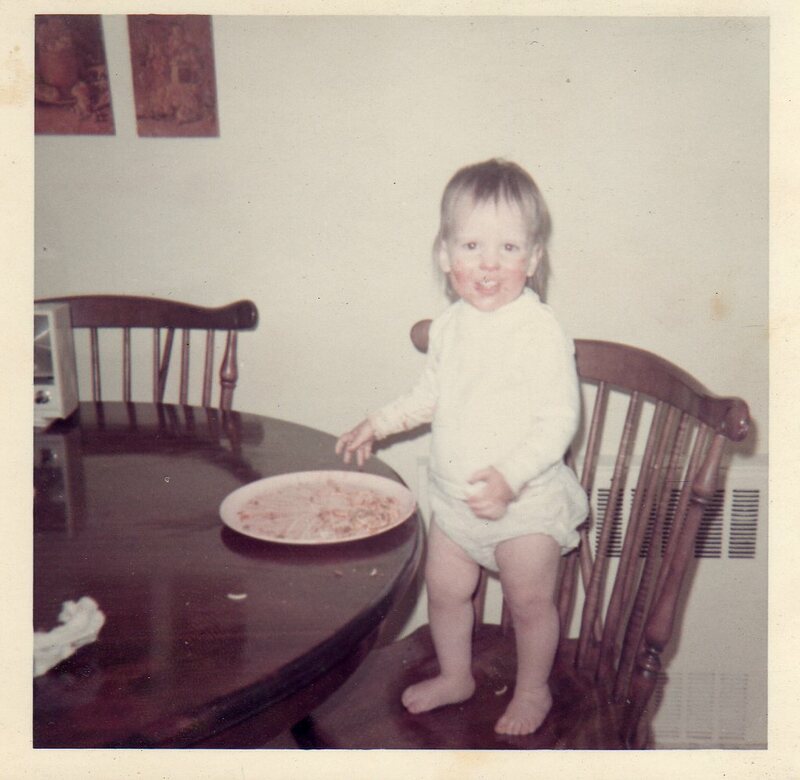 This is a picture of me, circa 1969, after indulging in a plate of spaghetti. As you can see, I wore my food, which means I really enjoyed it. Sometimes even today, my husband will walk by me and point to peanut butter in my hair or a bread crumb on my cheek or barbecue sauce on my shirt. 1. Using a 1-inch round biscuit cutter, cut 48 circles out of the bread slices. Set aside. Save the bread remainders for homemade croutons or stuffing. 2. Place a rack in the middle of the oven and preheat the oven to 350 degrees. Prepare a cookie sheet by lining with parchment paper. 3. In a food processor, blend together the cheeses, the egg, the peppers and salt until the mixture is creamy and smooth. 4. Using a small flat spatula, mound a bit of the cheese mixture, approximately 2 teaspoons, onto a bread round – higher in the center and smooth at the edges – then place onto the prepared cookie sheet. 5. Once you have covered all of the bread rounds with the cheese, place the cookie sheet in the preheated oven and bake for approximately 20 minutes or until the coins are golden brown on top and a little puffy. 6. Serve immediately with sliced pears, roasted almonds and a chilled glass of Pinot Grigio. These make a great appetizer for a party or as part of cheese course after the main entrée. P.S. I’ll post a picture of the cheese coins once I get them baked. They usually don’t last long.